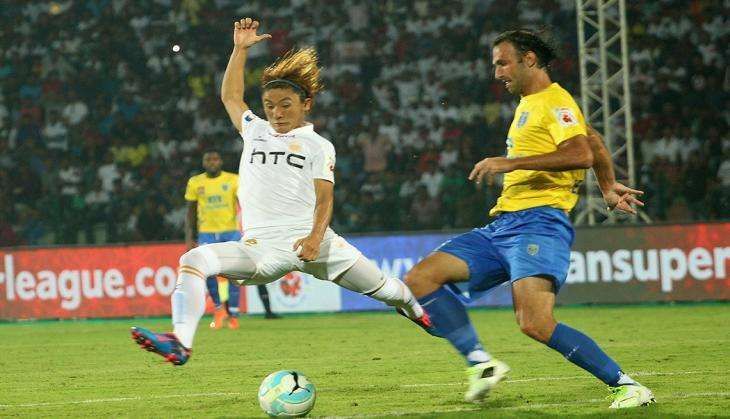 NorthEast United FC kick-started their campaign in the third edition of the Indian Super League (ISL) at the Indira Gandhi Athletic stadium in Guwahati on a winning note with a 1-0 victory over Kerala Blasters in Guwahati on 1 October. After a barren first session where NorthEast United dominated for long spells, Katsumi Yusa scored the all-important goal in the 54th minute. NorthEast United were determined to get a positive result from the opener and fielded an attacking line-up with Nicolas Velez, Holicharan Narzary and Emiliano Alfaro in attacking positions. Kerala, on the other hand, were content in soaking up the pressure which they did well in the first 45 minutes but succumbed to NorthEast's might in the second session. NorthEast United started the stronger of the two teams although there were hardly any chances in the opening minutes. The home side got their first look at goal in the 24th minute, thanks to a sloppy pass by Kerala goalkeeper Graham Stack which was almost captialised by Nicolas Velez. The lazy kick fell to Romaric who struck from a distance but had no power to beat and embarrass the rival goalkeeper. A free-kick midway into the first session saw Velez out-jump his marker and head towards goal but Stack did well this time to stretch wide and keep out the danger. NorthEast were continuously attacking in the opening 45 minutes but had nothing to show as the strikers were found wanting. The home defence was relaxed for most part of the first half but centre-backs Mailson Alves and Gustavo Lazzaretti were needed to stay alert whenever the three-man strike force of Kerala Blasters worked their way on top. Two successive attempts in the 35th and 36th minutes were the closest they got but Antonio German's shot from about 30 yards fell into the safe hands of goalkeeper Subrata Paul and Sandesh Jhingan could not direct his header towards goal. After near misses in the first half, NorthEast United finally tasted success in the 54th minute. It was Velez who made it happen after dancing down the left flank and essaying a cross which the Kerala defence missed and Katsumi was only too happy to speed forward and tap it into the goal. Kerala Basters tried hard to find the equaliser and came close just after the hour mark. Jhingan's attempted cross sailed unintentionally towards goal and Subrata Paul dived frenetically to keep the ball away from danger. From the resultant corner kick, Subrata left his charge needlessly got stranded but German's strike from close range missed the target by a whisker. The match was preceded by the opening ceremony. The celebrations were highlighted by the Bollywood celebrities who were joined by MS Dhoni and Sachin Tendulkar representing their respective teams. Also present on the occassion was Olympic Silver medallist PV Sindhu.